Google Now (and System sounds in general) are muted. I use Open Mic+. After a while, I started noticing that Google Now wouldn't speak back to me. The speaker icon was showing, but it wouldn't make any noise. 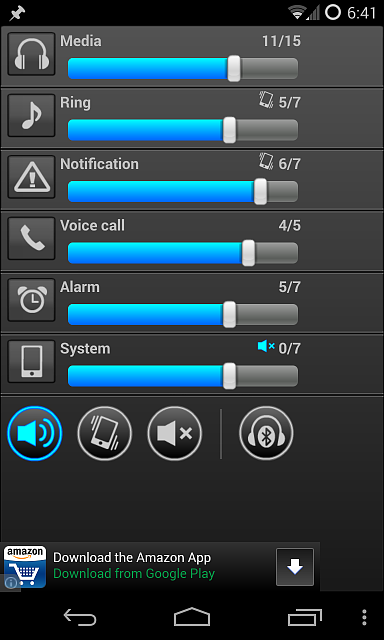 I downloaded Volume Control+ to check to see if anything's muted under the hood. The only thing muted was "System" with the bar at 0. After turning the bar up, the "mute" symbol still persisted next to it and it still said 0/7. Restarting my phone fixes this issue but it persists after a few hours. It also seems to randomly go away after having Open Mic+ off and charging disconnected for a few minutes. Could this be an app issue? I use Cyanogenmod 11 nightlies, but I had this problem earlier on stock Jellybean. CM11 is still in very early stage so I'm not surprised with these bugs. I said I had this problem before on stock Jellybean before I rooted. Have you tried uninstalling the open mic app and seeing if the problem persists? Is there a way to sync Google Play Music to the stock Samsung music player?